OCTOBER 5, 2017 / Vancouver, BC – NRG Metals Inc. (“NRG” or the “Company”) (TSX-V: NGZ) (OTCQB: NRGMF) (Frankfurt: OGPN) is pleased to announce the completion of a water well at its Salar Escondido lithium project in Catamarca province, Argentina. The well was drilled to 50 meters, and will provide sufficient water for the start of Phase One core drilling, to be completed by AGV Falcon Drilling SRL of Salta, Argentina. The first hole which is targeted to be drilled to a depth of 350 m, is expected to be started next week. AGV has extensive experience in the drilling of salar targets in Argentina, including the Rincon, Cauchari and Rio Grande salars. 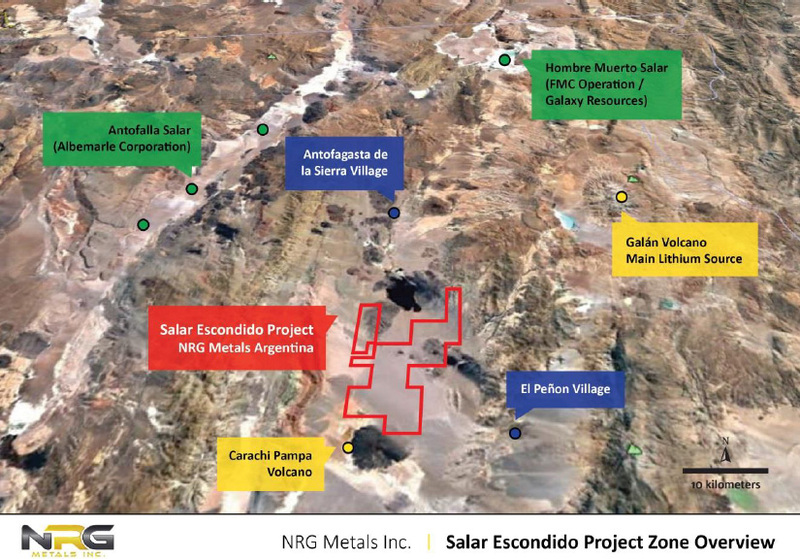 The Salar Escondido project comprises mining concessions totaling approximately 29,180 hectares (72,100 acres) located 280 km southeast of the provincial capital of Catamarca. The project location is shown in the following figure. The Salar Escondido lithium project, showing the location of Albemarle’s Antofalla lithium project and FMC’s producing Fenix lithium mine and Galaxy Resources’ Sal de Vida lithium development project in the Salar de Hombre Muerto. The Salar de Hombre Muerto is also the location of the Company’s Hombre Muerto North lithium project. The nearby Cerro Galán Caldera has been postulated to be a primary source of lithium deposits in the region. As previously reported, Salar Escondido is a large basin, roughly 20 by 40 kilometers in size, which is mostly covered by a series of overlapping alluvial fans. NRG’s technical team believes that a large salar with an area of at least 700 km2 developed in the basin about 2 million years ago. After the salar was formed, it was buried by coalescing alluvial fans, and it is thus considered to be a “paleo-salar.” Hence the name Salar Escondido, which means “hidden salar” in Spanish. Only a small portion of the original brine salar is presently exposed at surface in a small saline lake in the southwest portion of the basin. The brine in the lake contains anomalous lithium values. in 2016, the Company tested the paleo- salar hypothesis by conducting a Vertical Electric Sounding (VES) geophysical survey over the central part of the basin. The survey detected an extensive zone of very low resistivity. The Company believes this zone represents a paleo-salar saturated with saline brine that may contain lithium. NRG Metals Inc. is an exploration stage company focused on the advancement of lithium brine projects in Argentina. In addition to the Salar Escondido lithium project, the Company is evaluating the 3,287 hectare Hombre Muerto North lithium project in the province of Salta. The Hombre Muerto North project is located at the northern end of the prolific Hombre Muerto Salar, adjacent to FMC’s producing Fenix mine and Galaxy Resources’ Sal de Vida development stage project. As announced in a press release dated July 13, 2017, the Company has filed an Environmental Impact Study and applied for permits to drill the Hombre Muerto North Project. NRG Metals Inc. currently has approximately 68 million shares issued and outstanding, and trades on the TSX Venture Exchange under symbol NGZ, on the OTC QB Market under symbol NRGMF, and on the Frankfurt Stock Exchange under symbol OGPN. The preparation of this press release was supervised by Mr. William Feyerabend, a Certified Professional Geologist and a member of the American Institute of Professional Geologists, and a Qualified Person as defined under National Instrument 43-101. Mr. Feyerabend approves the scientific and technical disclosure contained in this press release. On Behalf of the Board of Directors of NRG Metals Inc. This news release contains certain “forward- looking statements” within the meaning of Section 21E of the United States Securities and Exchange Act of 1934, as amended. Except for statements of historical fact relating to the Company, certain information contained herein constitutes forward- looking statements. Forward-looking statements are based upon opinions and estimates of management at the date the statements are made, and are subject to a variety of risks and uncertainties and other factors which could cause actual results to differ materially from those projected in the forward looking statements. The reader is cautioned not to place undue reliance on forward- looking statements. The transaction described in this news release is subject to a variety of conditions and risks which include but are not limited to: regulatory approval, shareholder approval, market conditions, legal due diligence for claim validity, financing, political risk, security risks at the property locations and other risks. As such, the reader is cautioned that there can be no guarantee that this transaction will complete as described in this news release. We seek safe harbor.